A big thank you to the wonderful people at The Bike Shed Company who supplied a fabulous bike store for Fiona’s garden in Nottingham in this week’s episode. The Bike Shed Company believe in creating high-quality products which last and do what they’re supposed to do and we can vouch that they provide a friendly and efficient service at every stage. Their sheds are designed and hand-built at Bower Ashton Wood Yard which is part of the historic Ashton Court Estate, in Bristol. The wood yard is a co-operative space occupied by a diverse group of independent businesses and craftsmen, all of whom work with timber that is responsibly sourced from UK forests. 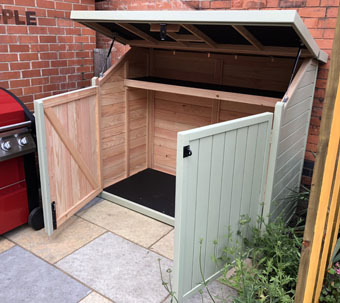 If you need a practical, stylish, quality solution to the problem of how to store yours or your family’s bikes, The Bike Shed Company will definitely have the answer. Gravel Master has been a gre at support to Love Your Garden supplying to the programme top soil, cobbles, bark chippings, building aggregates and decorative gravels to name but a few of the products from their extensive range. Gravel Master can supply to anyone from home owner to large businesses. Their customer support is second to none so for all your decorative aggregates and landscaping products look no further than Gravel Master. Rendit have the benefit of over thirty years experience in the formulation, supply and application of pre-mixed render materials and systems. Rendit are suppliers of all types of render systems and stock all types of finishes, from stone and brick to plain white or monocouche through coloured renders all at competitive prices. Rendit on-site services are available nationwide with help and technical advice available to assist with application or problems, regardless of how large or small. Special Thanks to Grasslands Nursery for supplying some of the plants on our Love Your Garden: NHS Special at Royal Manchester Children’s Hospital. Grasslands Nursery is a family run business that grow their own trees, shrubs, perennials and all manor of garden beauties. As a fully functioning horticultural nursery everything we produce is done in volume and is the freshest quality. A visit to our massive retail area is a must for plantaholics and we guarantee you plant pleasure overload. Love Your Garden: NHS Special featured Trachelosperum Jasminoids Pleached Frames which blossoms an abundance of star shaped white flowers woven through and around a bamboo frame to ensure its density and shape offering a peaceful screen for privacy and shading where needed to collect ones thoughts or simply admire. These were used in the garden and installed into large planters with beds of colourful and sensory flowers in front of them giving a mesmerising vision of tranquillity. We grow shrubs, hedging, perennials, topiary & specimen plants. Delivered across the whole of the UK. Grasslands Nursery – Making Gardens Happy, Making You Happy.